It seems very mirrored in that both Williams and Ferrari were the superior cars for most of the season but the drivers could not capitalise to build a lead which lets in their rival . Hamilton like Schumacher just keeps slowly chipping away extending his lead and putting in breathtaking performances that are simply awesome. Any assessment of Ferrari’s late-season slump must be seen against the background of the sudden death of their chairman and chief executive, Sergio Marchionne, in July. His replacement as chairman is John Elkann, the boss of Fiat and grandson of Gianni Agnelli. Elkann does at least have Ferrari blood in his veins. The man with the day-to-day responsibility is the new chief executive, Louis Camilleri, who had previously spent 40 years with the Philip Morris cigarette company. This is no coincidence, since Philip Morris has been the team’s most significant sponsor since 1973, and Camilleri was already on Ferrari’s board. Reporting to him is Maurizio Arrivabene, a former Philip Morris marketing executive handling the commercial relationship between the two companies and became the team principal in 2014. So now the Scuderia is being run by two men with a background in selling cigarettes, whose former employer maintained a deep relationship with the team despite a ban on tobacco advertising in F1 which came into effect – belatedly overcoming intense lobbying by the interested parties – in 2007. Their Marlboro brand was the team’s title sponsor, so influential that at one point the famous Ferrari red changed hue to match that of the cigarette packet. After the ban, a giant barcode resembling the word Marlboro and then a white chevron against the red background on the cars’ engine covers sent subliminal reminders of the tobacco company’s message. The problem for Arrivabene is that when he looks along the pit wall at the men managing the other top teams – at Mercedes’ Toto Wolff, Red Bull’s Christian Horner and Helmut Marko, and others – he sees rivals with a background in racing rather than marketing. It may be no accident that the team’s last period of sustained success occurred when the running of Michael Schumacher’s car was being overseen by such men: a bunch of proper racers. At Mercedes, Wolff recognises that Hamilton has a complicated temperament and works hard to get the best from his No 1 driver. Neither Arrivabene, Camilleri nor anyone else at Ferrari has the background that would enable them to give constructive advice to their own four-time world champion, or to supervise the finer points of race strategy. And on that factor, perhaps, hangs the destiny of this year’s title. Sorry Ruslan I have to completely disagree with you on this one. It wasn't about the points at this stage it was about being in a position to beat and push your rival no matter how superior you think their car is. Sitting behind Verstappen was only going to let Hamilton get comfortable and cruise. If Vettel had got as near to him as possible as quickly as possible then it was always going to be an extra pressure on Hamilton. 9 times out of 10 it will come to nothing but you have to do what you can. It's the difference between real competitors and also rans. I can in noway argue that the execution was correct but the tactical thinking was sound. Anyway I am surprised Verstappen only got 1 penalty point for his shove on Raikkonen. I do think if Max was banned for 1 race it might tell him to watch it next time and the same goes for Magnussen who Le Clerc branded " He will and always be stupid !" Il_leone very interesting. I think that the similarities between Vettel and Hill (a driver which I truly admired in his days) are not limited to what you described but also how they go about their racing. I remember when Hill was in F3000 and I was struggling doing my bits I saw him on a couple of occasions at the start of some races take the lead and try to go on the outside of the first corner not to slam the door in front of his opponents, in a sense he was trying to be quick and not to slow down the others (I'd say that the difference between such two attitudes is massive) and I was very impressed, I though that I would do the same (my competitors didn't agree...). In a sense Vettel reminds me of that approach, he is trying to beat "the system" on his own and using what he sees as fair means. Maybe Vettel should have looked at those old F3000 races because if I remember correctly Hill went out and didn't win. I think someone should ask FiA why Verstappen is not sitting next race out, so he can cool down? Taking two red cars out in one race is not enough for them, so what is? Take a critical look on Verstappen's driving style since he was appointed to RBR seat, and one has to be blind not to detect pattern of behavior which crossed a few red lines with blame being re-directed elsewhere from the popular wonder-boy. I am waiting when Max will be nominated for SCOTUS as a special case to get things going there. - Flight of an angel. Hamilton like Schumacher just keeps slowly chipping away extending his lead and putting in breathtaking performances that are simply awesome. Like Schumacher, he has the car to put in those performances, lap times like those in Singapore aren't only a result of a gifted driver nor a race win by +40 sec.. That is what I meant earlier in the season, as soon as Vettel is on top of Hamilton, it's the car, if it's the other way around it's the driver. The Ferrari has been hyped for no reason and their poor form since Monza has shown that it was not anything Mercedes had to fear or utterly dominant. Schumacher didn't build the team around, he had people like Todt and Brawn coordinating all aspects of the team and highly talented staff such as Byrne. They also went testing like no other team which gave them a huge advantage something that teams can't do nowadays. 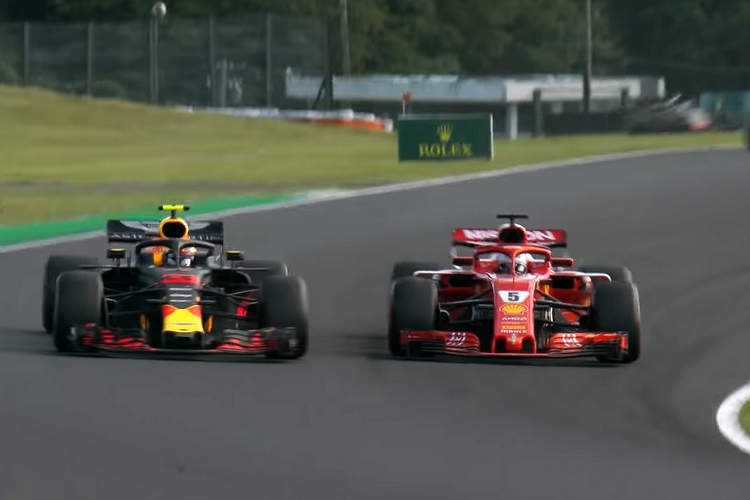 If it weren't for the engine advantage Ferrari and Mercedes have over Renault and Honda, I think that Red Bull would have won most titles in the past few years because they have better staff than any other team on the grid. Clay you have a point, even though if you speak to most people who worked for Ferrari during that era they will all agree that Schumacher was pivotal in building up the team, especially in terms of technical direction, he was the guy who clearly said what he wanted and took the engineers "by the hand" and led them where he wanted to get, the current drivers are in one case not much bothered and with not a very forthcoming attitude and the other one follows what the engineers tell him. A school friend of mine worked for Ferrari during the Schumacher era as well as after that and he says that the difference is huge, my friend is a very academic guy and he rates people on the basis of what he perceives their brainpower to be and he always said that even though Schumacher had no academic qualification in his opinion he was a genius. He also always said that alough he rated Schumacher as a very good driver he was not on a different level from his peers in pure driving terms but his brainpower put him on a different level. Publius Cornelius Scipio I suppose you’re right. Schumacher’s work ethic was also extraordinary and that set him apart from his brother and Heinz Harald Frentzen who were considered more talented than him when it came to driving ability. I was only talking about the top three teams. Otherwise I agree Force India, or whatever their current name is, is amazing on a points per $ ratio. Don't forget that both Byrne and Brawn knew they were on to a winning driver and followed Schumacher from Benetton to Ferrari. It was not coincidence that they all moved to the Red Menace at the same time. Clay What I find amazing about Schumacher is the fact that he could change the angle of attack of a corner even 3 times, normally you commit and take that line, he could change it without losing any time, if I were driving a corner I would be thinking of the next one to get the car in the right position for it, he had the ability to divide each part of the track into many small sections and do several actions at the same time. My friend says that his multitasking was amazing and that his radio messages were always so precise and detailed that at times they could hardly keep up with him. I think that it's also fair to remember that he was the first driver to fully take advantage of the changing brake bias or diff settings, he used to change such settings at most corners, now we think that it's easy because they have a program on the steering wheel with all the changes already set for each corner but before digitalisation it wasn't a walk in the park, in order to change brake bias you used to operate a lever with no set positions, I'm amazed that he managed to get it right and that he had the ability to think while he was driving at how to operate that lever. In my days I adjusted the brake bias only (a handful of times) if I had some issues with my tyres, I would never touch that things for fear of getting things wrong, and I was among the smart guys who had the sense to change the settings when things weren't quite right. I think that people easily underestimate such achievements. Schumacher is - by trade - a car mechanic. How often we heard stories about him at 3 am working with mechanics on his car, helping out with assembly. Maybe it meant little in terms of building a team around him, but surely he let them feel that he was one of them. Today the same is almost impossible just on grounds of equipment complexity. Have a look on their respective positions, and explain why is no one questioning Verstappen that he should have yielded to Ferrari. Vettel is next to RB, Max is not yielding, and all what transpired after felt onto Vettel's head. I am lost. Because max is an idiot who subscribes wholly to the collision rather than being overtaken approach of "racing". It's sad, but for all the mistakes Vettel made this season, his only one there was slinging one up the inside of a driver who is a bit "crashy"
If memory serves me, there used to be (unwritten?) rule defined by Whiting, that a car is being considered physically in overtaking position when front axel is in alignment with a rear wheel of the leading car. Vettel seems to be at least that advanced position, which placed obligation on Verstappen to cooperate, and leave space. I do consider totally inappropriate comment from Horner that Seb should have known better that Verstappen will never yield. If so, at that case FiA should have stepped in, and bench him, rinse and repeat as many times as needed, and until Max will get the message, and behave.